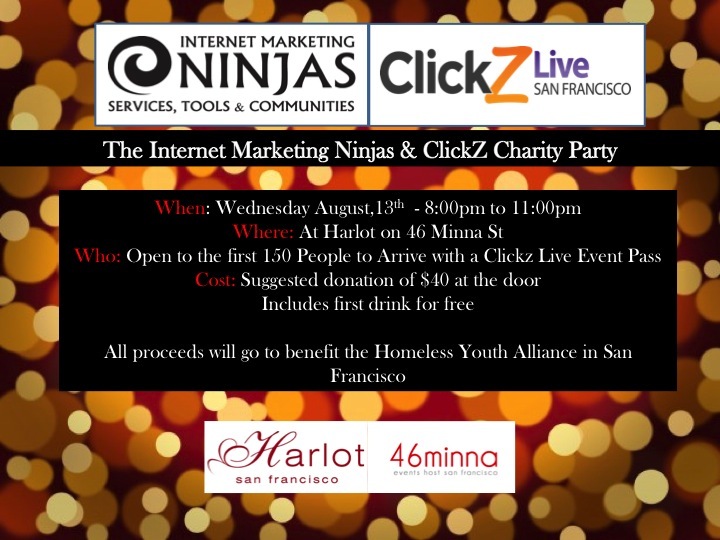 Internet Marketing Ninjas is teaming up with ClickZ Live to jointly sponsor a Charity Party on August 13th 2014 from 8:00pm to 11:00pm. This will be a private event in conjunction with Clickz Live San Francisco. The party, to be held at Harlot on 46 Minna, will be open to the first 150 people with a conference event pass. There will be a suggested donation of $40 at the door which will include 1 free drink and all proceeds will go to support the San Francisco Homeless Youth Alliance. Clickz Live San Francisco is an industry leading digital marketing conference that focuses on learning and professional growth for internet marketers. The conference itself will run from Monday August 11th through Thursday the 14th. “We’re going to party and network and help a great cause to make the world a better place. If you’re going to be at ClickZ Live next month, this is a must attend event. Boykin concludes “Though we’ve held several charity parties in the past, this party with ClickZ, to help the homeless youth of San Francisco, is one that is very personal to my heart”. Both ClickZ and Internet Marketing Ninjas are just glad for an opportunity to be a small part of that great work. HYA was founded by and is staffed by young people who were once on the streets. They’ve hired many of their former participants as Outreach Counselors, and have seen countless more go on to college, careers in social services, and stable, empowered lives. “I want to give back what you guys gave to me,” is a refrain HYA staff hear regularly. Approximately 90% of HYA participants use its services exclusively, because it is the only program that they trust and feel comfortable with. According to the HYA website, the agency makes 13,000 contacts annually with at-risk youth. In addition to individual and group counseling, case management, and mental health and medical services, the group’s counselors distribute educational materials, along with food, health, hygiene and other essential supplies. The official press release will be available online soon! Founded in 1999, Internet Marketing Ninjas is a full service Internet marketing company. Then called We Build Pages, CEO Jim Boykin founded and developed a team of SEO experts now located in Clifton Park, New York. With re-branding to a new name in 2011, Internet Marketing Ninjas grew to include social media, content development, digital asset development to accompany their already exceptional consulting and link-building services. They remain leaders in search engine visibility, engagement, and brand authority. In the past few years, Boykin has also acquired the Developer Shed Network . These communities include SEO Chat and Dev Shed, providing a wide range of SEO/SEM practices with information and instruction related to programming and web design. ClickZ Live evolved last year from SES to fit the growing needs of the Internet business community. As attendee needs developed beyond search marketing, ClickZ expanded accommodate the rapid growth of the industry and have added new content, in the fields of social media, mobile, digital TV advertising, marketing and display. ClickZ Live events not only meet the diverse educational need of modern online marketing that reflect the state of the industry, it is the best way to improve your SEO skills while sharing your knowledge with other digital marketing thought leaders. HYA offers a sanctuary for homeless youth between the ages of 13 and 29 who find themselves fleeing abuse, neglect, and poverty to seek refuge in the Haight Ashbury and Golden Gate Park. HYA reaches out to young people who are often considered the most “hard-core” subset of homeless youth in San Francisco: those who have trouble engaging with more traditional service providers. The program focuses on youth who fall through the cracks, to let them know that they have a home and unconditional love at HYA. HYA’s cultural authenticity is a huge part of its appeal to these youth. Most members of HYA’s outreach team have had personal experiences with homelessness and addiction, and so are able to connect more deeply and honestly with Haight Ashbury’s homeless youth. These connections are more important now than ever before. For twelve years, HYA ran a drop-in center on Haight Street, equipped with a full kitchen, bathrooms and showers. But in January 2014, their lease was terminated by their landlords, who plan to lease the space to a retail outlet and quadruple the monthly rent. Since losing their building, HYA has been operating as an entirely mobile program. They perform street outreach every day, and still provide medical and mental health services, harm-reduction education, and referrals. Their work is more challenging than ever, but their commitment has not flagged: since losing their lease seven months ago, they’ve placed 8 youth in permanent housing. The program is currently looking for a new permanent space where they can once again offer a stable refuge for the kids of the Haight. Non SEO: Feed the Homeless in Orlando Florida and go to Jail! Cat Post 2: Giving Back to San Francisco. Giving Food to Homeless. Jim Boykin’s Internet Marketing Ninjas Club Band. Such a noble deed. Well done, guys.